The Metropolitan Flute Orchestra has presented several European concert tours, including France in 2001, Ireland in 2008, Germany, Austria and Slovakia in 2012, and Hungary, Poland, and the Czech Republic in 2014, and England and Scotland in 2016. In addition to these European concert tours, the Metropolitan Flute Orchestra was selected and performed during the National Flute Association Conventions in 2000 (Columbus, OH), 2006 (Pittsburgh, PA), 2009 (New York City, NY) and 2011 (Charlotte, NC). Next we are preparing to tour Iceland in July of 2018, with concerts in Reykjavik and Akureyri. The Metropolitan Flute Orchestra, in summer residence at New England Conservatory in Boston, Massachusetts, presented an exciting concert tour in England and Scotland, July 2016. Directed by Paige Dashner Long, the MET presented concerts in London and York, England, as well as in Glasgow and Edinburgh, Scotland. The ensemble performed beautiful music representing England and Scotland – Flute Fling! with some American Flute Bling! In addition, prior to heading across the “pond,” the Metropolitan Flute Orchestra presented a concert in New England Conservatory’s renowned Jordan Hall as part of the 15th Annual New England Conservatory Summer Metropolitan Flute Festival. Each concert included a little “knight music” such as Sir Edward Elgar’s Pomp and Circumstance March No 4, Sir Edward German’s Three Dances from Henry VIII and Jonathan Cohen’s lyrical new work The Legend of Llyn Llech Owain, a tone poem depicting Sir Owain, a knight of King Arthur’s court. In addition, audiences were treated to American music with Peter Senchuk’s jazzy piece Lower Wacker Drive and Eventide Soliloquy composed by director Paige Long. Well known classic, Felix Mendelssohn’s The Hebrides Overture, delighted audiences throughout the UK. Concerts concluded with two energetic Celtic pieces, Peter Martin’s Mixing the Malt and Doreen Carwithen’s Suffolk Morris. The magnificent Hampton Court Palace, a 1,000 room tudor palace on the banks of the Thames River just outside of London, was the venue for the first concert of this tour. The audience was treated to an original work for flute ensemble by British composer Keith Amos entitled Hampton Court Palace. Each of the movements tells a musical story of the palace, including a movement dedicated to the statesman for whom the palace was built – Cardinal Wolsey, as well as a movement about the famous Astronomical Clock. It was an amazing musical experience for all to perform this work in the palace that was the inspiration for the music. Next the ensemble traveled to the quaint old city of York, England to perform at the historic St. Helen’s Stonegate Church, located right in the heart of the old city center. The over flowing audience kept asking for more encores. The final concert piece, Mixing the Malt, was a favorite and the composer, Peter Martin, was in the audience. From York, the ensemble visited the scenic Lake District of England, following the footsteps of poets, taking a leisurely boat ride and sampling the world famous Grasmere gingerbread. Heading into Scotland, the next stop was Glasgow where the Metropolitan Flute Orchestra presented a joint concert with Flute Phonics, directed by Aisling Agnew. At Renfield St Stephen’s Church in the old city center, each ensemble performed separately and then joined forces to perform Oriss’s Towards the Blue Horizon. Commissioned for The Big Flute Challenge in Belfast 2014, Towards the Blue Horizon is a setting of five folk songs from the British Isles. The two ensembles spent a wonderful day together, rehearsing, performing and enjoying the musical exchange. The Metropolitan Flute Orchestra looks forward to future collaborations with their new Scottish friends! The final concert of the 2016 tour was held in the amazing Great Hall of Edinburgh Castle, perched high on Castle Rock, at the top of the Royal Mile in Edinburgh. Serving as the chief place for royal ceremonies and banquets throughout centuries, the Great Hall is steeped in historic events and now is home to an impressive collection of armory. One might have mistaken the contrabass flutes of the Metropolitan Flute Orchestra for part of the massive collection of armor. Our enthusiastic audience filled the hall and swelled beyond. Performing in this Great Hall was a rare treat and a thrilling end to the Metropolitan Flute Orchestra 2016 Concert Tour to England and Scotland! The Metropolitan Flute Orchestra concert tour to Hungary, Poland and the Czech Republic was a resounding success, with concerts in Budapest, Hungary; Krakow, Poland; and Kromeriz and Prague in the Czech Rebuplic. With a theme of “A Bohemian Flute Rhapsody”, the ensemble performed beautiful music representing the countries we visited, including von Suppe’s Pique Dame Overture, Liszt’s ethereal Angelus! Prayer to the Guardian Angels, and the exciting Danse Slav by Chabrier. Two well known and loved classics, Dvorak’s final movement from the “New World” Symphony and Liszt’s Hungarian Rhapsody No 2, captivated audiences everywhere. In addition, audiences were treated to American music with a jazzy rendition of two spirituals, Eventide Soliloquy by director Paige Long and Cohen’s L’Esprit des Petits Enfants. Each concert venue was filled to capacity, with some concerts having standing room only. To an enthusiastic audience of over 1,100 in the historic St. Stephen’s Basilica in Budapest, the Metropolitan Flute Orchestra’s opening concert was a benefit concert, raising money for a Hungarian children’s charity. To be selected to perform in such a magnificent venue, with an overflowing audience, was an incredible start to the concert tour. Next the ensemble headed to Krakow where we performed with Polish flutists in the Renaissance Room of the Polonia House, in the old city center. There is a permanent exhibition of posters, photographs and memorabilia connected with Frederic Chopin in the Polonia House. It was great fun meeting and performing with Polish flute professor Renata Guzik from the Academy of Music in Krakow. The Palace of the Archbishop’s in Kromeriz, Czech Republic, the third concert venue, is a majestic palace steeped in history. In this palace Emperor Franz Joseph 1 took over the throne, Russian tsars and Austrian emperors held strategic conferences, and visiting dignitaries have stayed, including Pope John Paul II. The large, ornate concert hall, where the Metropolitan Flute Orchestra performed, was used in the filming of the movie Amadeus. In addition to the incredible rooms of the palace, the sculptured lawns and gardens were beautiful. In Prague’s Old Town Square, just steps away from the famous astronomical clock, is the beautiful St. Nicholas Church, where the ensemble played the final concert of the 2014 concert tour. With resounding standing ovations at the end of every concert, audiences keep asking to hear more music. The sound of this spontaneous applause is music to the ears of the flutists in the Metropolitan Flute Orchestra. This truly was an incredible “Bohemian Flute Rhapsody”! 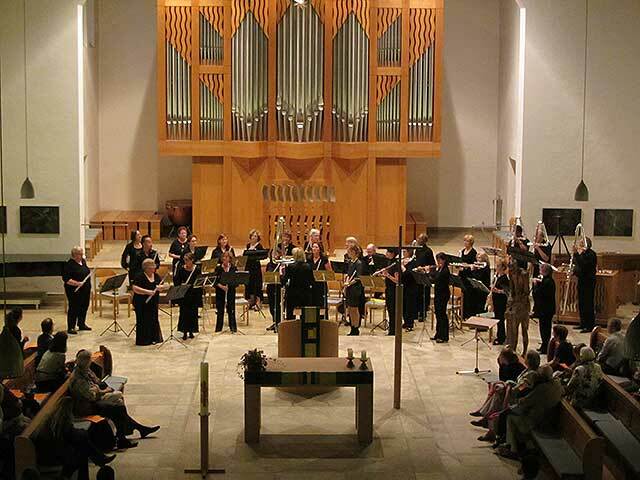 In July of 2012, flutists from the select ensemble of the Metropolitan Flute Orchestra presented an exciting concert tour, performing concerts in Munich, Germany; Hallstatt Austria; Bratislava, Slovakia and Vienna, Austria. Musical selections included works from German, Austrian and Slovakian composers, as well as American composers. The music was a wide variety of classics such as the Scherzo from Beethoven’s Symphony No 6, the first movement of Mozart’s Symphony No 41, “Jupiter”, Brahms Hungarian Dance No 5, Dvorak’s Slavonic Dance No 7, as well as Coleman’s Pontchartrain, ending in New Orleans jazz and traditional American shaker tune, Simple Gifts, sung by percussionist Elizabeth MacDonald. The crowd pleasing encores were eBow’s Ride the Matterhorn and Strauss II Tritsch-Tratsch Polka. Within the ensemble on tour, there were three American composers: Jonathan Cohen in the contrabass section; Laurence Dresner in the percussion section and Paige Dashner Long as director and sub contrabass flute in G. The ensemble performed Cohen’s Notes From the Flock; Long’s award winning composition Eventide Soliloquy, as well as a new flute orchestra work by Dresner, Funk and Variations. In Munich, the ensemble presented a joint concert with the Munchner Flotenensemble. (Munich Flute Ensemble) The ensembles performed separately, as well as joining together to perform the first movement of Mozart’s Eine Kleine Nachtmusik and Klengel’s Hymnus, Opus 57. The Mozart was arranged by the directors of the Munich Flute Ensemble Elisabeth Weinzierl and Edmund Wachter and the Klengel was arranged by Paige Long. Next, the ensemble headed to Salzburg, Austria and the beautiful Salzkammergut district, the lakes region. The enthusiastic audience in the picturesque village of Hallstatt, Austria was one of the many highlights of the tour. Of course while in Salzburg, the MET toured the home where Mozart was born and visited the cathedral where Mozart was baptized, while enjoying the beautiful Austrian scenery. At the Franciscan Church in the old city center of Bratislava, Slovakia, playing to a standing room only crowd, the ensemble performed a full concert, plus three encores. The audience kept asking for more. Next the ensemble headed to the Austrian capitol of Vienna, the city known as the music capitol of the world. 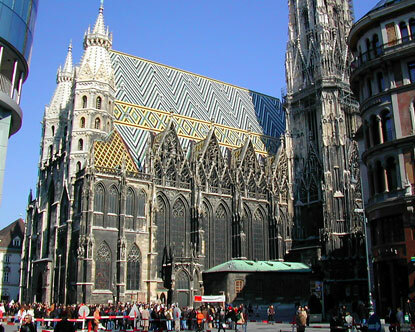 The final concert of the Metropolitan Flute Orchestra tour was presented in the rooftop concert hall of the historic St Stephen’s Cathedral in Vienna. ** The concert hall was sold out and the concert raised over $5,000 Euro (approx $6,300) for the restoration of the cathedral. Members of the ensemble were also able to walk outside of the rooftop hall and touch the famous diamond- patterned tile roof of the cathedral. What an incredible way to end a concert tour! ** The Gothic cathedral of St. Stephen’s is an historic and cultural landmark. The young Haydn was a choir boy for St. Stephen’s and both Mozart and Haydn were married at St. Stephen’s. Beethoven realized he was totally deaf when he could not hear the famous bells peal at St. Stephen’s and Mozart’s funeral was held in this historic cathedral. The Metropolitan Flute Orchestra, in summer residence at New England Conservatory, performed on Saturday, August 13 during the National Flute Association (NFA) Convention in Charlotte, NC. At 7:00pm in the lobby of the Belk Theater in Charlotte, the ensemble, directed by Paige Dashner Long, presented “Goin’ Coastal from Boston to Miami” performing works by Respighi, Long and Beethoven. During this same concert, The Florida Flute Orchestra, also directed by Long, presented Beach Music by award winning composer Catherine McMichael and then joined the Metropolitan Flute Orchestra to perform the first movement, Poco sostenuto-vivace, from Beethoven’s 7th Symphony in A Major. Director Paige Dashner Long, coordinator of the newly formed NFA Flute Choir Composition Committee and member of the NFA Low Flutes Committee, also led a low flute technique class, Down Deep with Low Flutes, on Friday, August 12 from 9:30-10:30am in the Convention Center. The Metropolitan Flute Orchestra, in summer residence at New England Conservatory, performed on Friday, August 14 during the National Flute Association Convention in New York City. On a flute choir showcase from 10:30-noon in the Empire Complex of New York’s Marriott Marquis Hotel, the ensemble, directed by Paige Dashner Long, presented works by Awano and Martin. On this showcase was also The Florida Flute Orchestra performing works by Mendelssohn, Molnar-Suhajda and Dvorak. In addition, Flutes Ad Libitum, directed by Martine Charlot from The Conservatoire Jean-Philippe Rameau in Dijon, France performed works by Mussorgsky, Lauf and Khachaturian. All three ensembles performing during this showcase have a wonderful performance history together, both here in Boston and Florida, as well as in France. The Metropolitan Flute Orchestra toured of France in July of 2001, visiting Flutes Ad Libitum in Dijon and hosted Flutes Ad Libitum in Boston in July of 1998. The Florida Flute Orchestra toured France in March of 2005 and has also hosted Flutes Ad Libitum in Florida in April of 2006. While on tour in France in 2001, the Metropolitan Flute Orchestra visited the Conservatoire Jean-Philippe Rameau in Dijon, presenting joint concerts with Flutes Ad Libitum. The majestic and beautiful Palais des Etats, where the States-General of Burgundy have met, was one of the concert venues while in Dijon. The Metropolitan Flute Orchestra also presented a concert during the prestigious French Festival Musical des Grands Crus de Burgogne in the historic medieval village of Noyers-Sur-Serein. Concerts in Paris and Roquebrune-Sur-Argens were also very well received. While on tour in France in 2005, the Florida Flute Orchestra stayed in the homes of French flutists in Dijon and performed with Flutes Ad Libitum at the Conservatoire Jean-Philippe Rameau. In addition, the FFO presented a concert tour in Provence sponsored by AICLER France. AICLER Provence, Association Intercommunale pour la Culture et les Loisirs en Region Provence, is an active arts organization in France. The purpose of this particular set of concerts was to bring high quality and unusual concerts to the smaller cities and towns in Provence. A real surprise in this series of concerts was the presence ofJules Massenet’s great-grandson at the concert in Tourettes sur Loup. As part of our concert program, we performed Dances from the Massenet opera Manon. Massenet’s great-grandson was delighted with our choice of programming music by his great-grandfather, and we were extremely pleased to meet him. In addition to the concert in Tourettes sur Loup, the group also performed in the Provencial towns of St. Tropez, Le Val, and Rognac. The Metropolitan Flute Orchestra was selected and performed at the 2000 and the 2006 National Flute Association Conventions in Columbus, Ohio and Pittsburgh, PA. In addition, the Florida Flute Orchestra performed during the 2006 NFA Convention in Columbus, Ohio. The Metropolitan Flute Orchestra, in summer residence at New England Conservatory, performed with Sir James Galway for a live FOX News TV shoot in Times Square on Friday, August 14 at approximately 9:00am. FOX News interviewed Sir James right before the Galway Guinness Record Breaking attempt for the largest flute ensemble, which took place at 10:00am during the National Flute Association Convention in New York City. Three additional ensembles were also invited to perform with Sir James in Times Square: The Florida Flute Orchestra, The Columbia Flute Choir and The Stanford University Flute Choir. Sir James asked the Times Square ensemble to memorize an arrangement of a lively Irish folk song, Brian Boru’s March. Metropolitan Flute Orchestra director Paige Dashner Long was invited to warm-up the combined ensembles prior to the much anticipated arrival of Sir James. Long also conducted the TV “bump”, a 30-60 video segment aired prior to a news story used to draw attention to an upcoming news feature. Sir James arrived in Times Square, talking with the ensemble prior to the live news shoot. He played several famous flute pieces, waiting for the live broadcast, and at one time, members of the Metropolitan Flute Orchestra jumped in playing a bass line for Sir James. During the interview, Sir James tired to teach the FOX News reporter to play the flute. Then immediately after the interview, Sir James when into the Marquis Ballroom of New York’s Marriott Hotel and conducted the record breaking ensemble of 1,989 flutists performing “Galway Fantasie”, an 8 minute piece commissioned by Sir James especially for this record breaking attempt. The previous record of 1,975 flutists was held by a Chinese ensemble. The Metropolitan Flute Orchestra Irish Tour in 2008 was a huge success, with concerts in Bantry Bay, Kinsale and Kylemore Abbey. In Kinsale, the ensemble joined together with 10 flutists in the Cork area to present the final half of their performance at the historic St. Moltose Church dating back to the 11th century. With a wide and varied concert program, the ensemble performed Lisa LeMay’s beautiful work Innes Glas Mor. This piece, inspired by the composer’s trip to Ireland, consists of three movements. The second movement, entitled Kylemore Abbey, musically describes the beautiful abbey located in Ireland’s rugged Connemara region. Kylemore Abbey is the monastic home of the Benedictine Nuns. Several of the nuns were present for our concert, as we performed LeMay’s Kylemore Abbey in the Neo-Gothic Chapel on the grounds of Kylemore Abbey. Performing to a standing room only audience, it was an amazing musical experience for all to perform this work with the people, chapel and country that inspired the beautiful music. While on tour in France in 2001, the Metropolitan Flute Orchestra visited the Conservatoire National de Region in Dijon, presenting joint concerts with the exceptional French ensemble, Flutes Ad Libitum, directed by Martine Charlot. The majestic and beautiful Palais des Etats, where the States-General of Burgundy have met, was one of the concert venues while in Dijon. The Metropolitan Flute Orchestra also presented a concert in the prestigious French Festival Musical des Grands Crus de Burgogne in the historic medieval village of Noyers-Sur-Serein. Concerts in Paris and Roquebrune-Sur-Argens were also very well received.